It’s only been a year since Nicola Glass took over the reins at Kate Spade New York as the Creative Director and she has already successfully managed to set a tone for the brand, providing glimpses of what’s to follow. 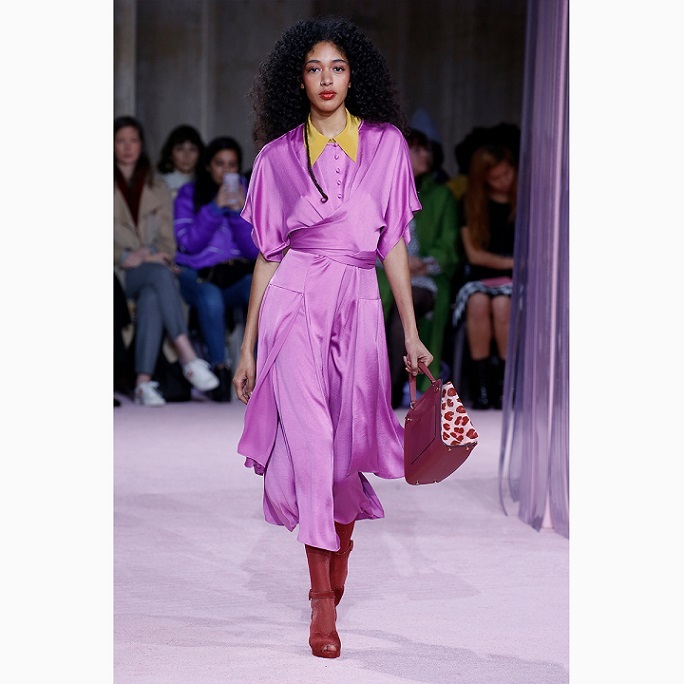 Yes, there’s still colour and the brand’s iconic penchant for prints and quirky shapes, but bright hues have been toned down to jewel tones and bows have given way to sharp suits and shirt dresses. Her first season was vintage-inspired and Glass continued this narrative into the Fall 2019 season. Taking over the iconic Cirpriani restaurant in downtown Manhattan, she rolled out a plush pink carpet replete with ghost chairs topped with pink pouffes and glass curtain-like dividers. 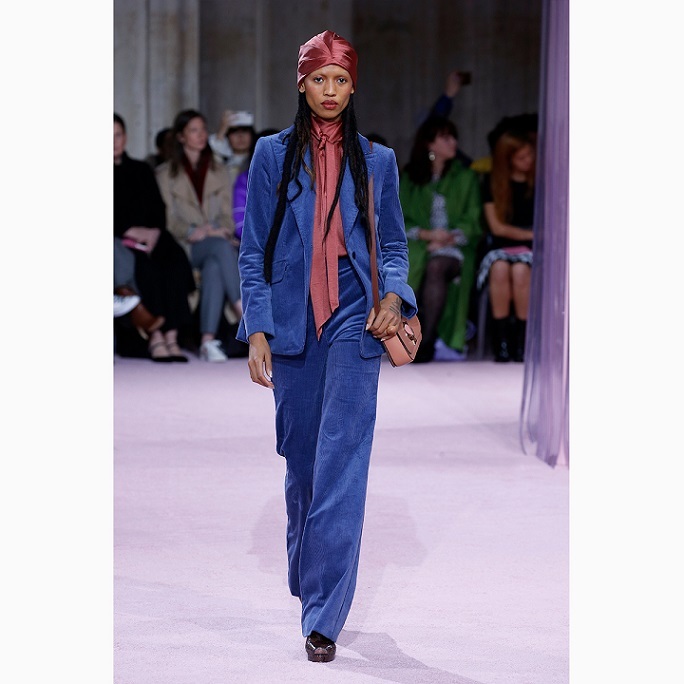 The mood was set for a ’40s-as-seen-through-the-’70s collection where jewel tones like canary yellows, purples and forest greens shone brightly on collared dresses, peacoats and cross-body bags, while animal prints roared on silky turbans and brushed wool coats. There was nothing cute about the sparkling tights that were paired with lace-up boots and turbans casually worn over tumbling curls; the undertones were strictly glamorous. The message was clear: The Kate Spade girl has grown up. Congratulations on your second collection for Kate Spade. What was your inspiration for this collection? My starting point was imagining raiding an insanely glamorous woman’s closet where you would stumble upon this eclectic and rich mix of prints, colours and silhouettes. I thought about how you could take these elements and make them your own. I envisioned women looking for clothes that are very feminine and spirited but really fundamentally effortless. There is a polished ease and a real fluidity to the collection that epitomises the idea of soft glamour. Kate Spade is known for its generous use of bright colours and quirky prints. How did you make these two factors your very own? Colour is very important because it is one of the things the brand is most known for. For this collection, the colours escalate from rich hues to very vibrant tones in addition to boasting an element of colour blocking. You will see mature colours like rich deep cherry woods and browns, deep evergreens and purples co-exist with fun pop colours like peppermint birch. I also went for a real mixture of animal prints that are not just on clothes — though you’ll see them on silk or wool — but also really coming through in the accessories. There’s a lot of printed pythons, high-polished patterned crocs and metallic printed cheetahs. What was the one thing you really had fun with when designing this collection? I have always liked an element of surprise and the idea of taking the customer on a journey. I like the fact that when you see these prints up close you know they are florals, but from far they come across as animal prints. For me, Kate Spade is a brand that should always put a smile on your face. The collection is super happy-go-lucky, but when it came to the novelty factor, we decided to go subtle so we retained the classic shape of bags but added hardware details such as the Spade lock. The coats are comfortable, soft, and drape beautifully. While we have a few shorter peacoat lengths, I have a soft spot for the longer ones. Our scarves are our trademark accessories and they’re a great way to showcase the prints. This season, we gave them a little spin in the form of turbans that we will also be retailing. I love wearing hats and hair accessories; they are so elegant. The other key accessories are fun yet classy mood rings. We have them in different colours and they are such subtle statement pieces. Kate Spade has a presence in major Asian countries, including India. How do you hope to strengthen the brand’s presence in this new and emerging market? As we continue to grow globally — whether its Japan, China or India — we are constantly thinking about the consumer and their unique needs. Ultimately, you do want your line to gain global recognition recognised, but there are certain nuances that we’re incorporate from time to time, like doing a longer sleeve length for the Middle East. While our accessories have a strong global presence, our goal is for the ready-to-wear collection to have an equally significant impact.